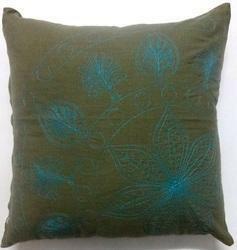 We are one of the leading Manufacturer and Exporter of Designer Cushion Covers. Due to our enormous understanding and massive knowledge of this business, we are involved in offering Beaded Cushion Cover. The cushion covers offered by us is available in various printed designs and can also be hand washed. This cushion cover is perfect for cushions and is also provided with a chain for easy opening of the cover. This cushion cover is available in a set of 4, 6 or 12 pieces. We take pride in offering a wide range of Handmade Beaded Cushion Covers are manufactured in diverse designs to match the distinctive decor. We also offer these in customized specifications as per the clients’ requirements. These are checked on various parameters to deliver a defect free range. We offer Cushion cover which are available in 100 of designs and ptterens. Our wide variety of cushion covers created using a wide variety of handicraft techniques, throwing wide open a choice of designs, colors and look, rich elegant cushion covers, to match any ambience. Our product consist of a unique range of Beaded Cushion Covers that can add ethnic charm in the ambiance. We offer you the choicest collection of cushion covers intricately crafted to perfection by our skilled craftsmen. 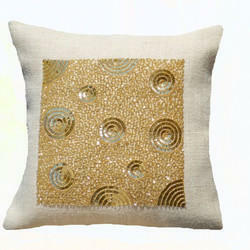 We use the finest beads, threads and sequins to offer you an exclusive range of cushion covers. The cushion covers offered by us are available in different patterns, shapes, embroideries, designs and colors. They can be tailor made as per the the requirement of the international market using the hi tech machines which help them in giving flawless finish. Complementing the cusion cover, we have matching bed sheet. These covers are embellished with beads to make them look eye appealing. The beaded cusion covers available with us are known for their designs and color combinations. We offer a wide range of Beaded Cushion Cover to provide a better satisfaction to our clients and to provide them with a wider variety of selection as per their choices. These are available in different colors, designs, color combinations, sizes, shapes, patterns and styles so as to suit diverse requirements of our clients.